Reports tell you what happened, but the best business intelligence software tells you what you really need to know – why it happened. Navigate your data to uncover the reasons behind performance, and use these insights to improve. Identify underperforming areas of the business. Pinpoint the most profitable products and customers. 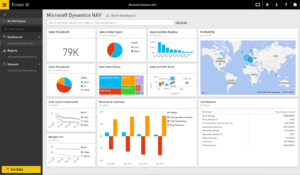 Power BI is part of the Office 365 suite by Microsoft. 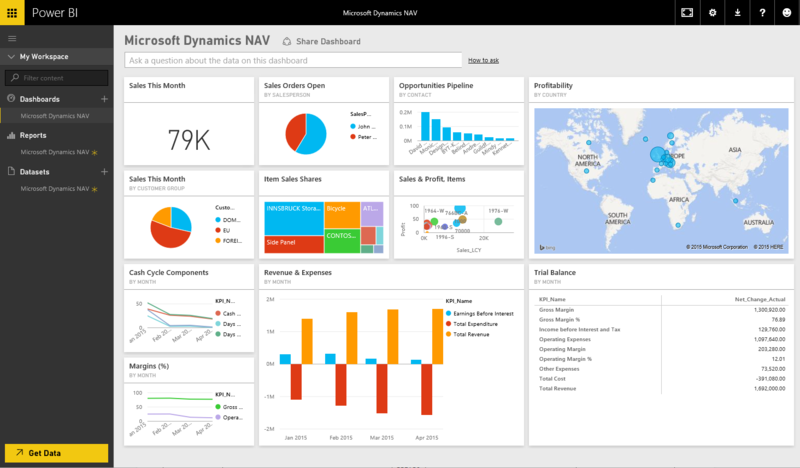 Power BI is a Business Intelligence and reporting tool by Microsoft that works great with Dynamics NAV. It connects to a wide range of data sources to allow you to easily create dashboards and reports. Previously known as Excel PowerPivot, Query and View, it’s evolved into its own product; a hybrid cloud-based service and a desktop-based report builder. We’ve built a suite of reports that cover Finance, Sales, Purchasing and Inventory. These get you up and running with minimal effort. Leverage the classic visualizations (line, bar, pie) but also bubble, maps, funnel and more. There’s even an ever-growing gallery of custom developed visualizations including networks, waffles, calendars and radars. Combine and mash up data from multiple data sources using protocols such as oData, and from an ever-growing list of cloud services such as MailChimp, Zendesk, Salesforce or Google Analytics. Natural language queries such as “Show my 2015 Sales by Brand” will generate a report on-the-fly with the relevant information. Monthly updates introduce new features and functionality at a regular pace.